Just the other night I watched a film that I had been meaning to watch for the past couple of years. Being a busy person, I kept forgetting about it until the other night. 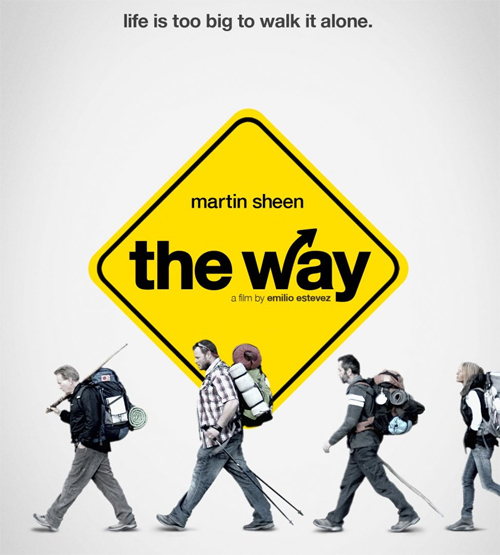 I was perusing Netfilx and I came across the movie, “The Way,” and remembered that I wanted to see it. The film was written and directed by Emilio Estevez and stars his father, Martin Sheen. The film is about a father who discovers that his son died during a storm while backpacking on the Camino de Santiago (“The Way of St. James”), which is of various lengths depending on where you start. The father, who spontaneously decides to complete his son’s trek, started in France and traveled by foot approximately 800 km or 497 miles. Along the way, the father meets and, eventually befriends, several people along the way. At that moment his son replies, “You don’t choose a life dad, you live one.” Wow, what words of wisdom. His father didn’t reply to him that day, which would be the last day he ever saw his son alive, but those words forever echoed in his head. “You don’t choose a life dad, you live one.” His son had hit upon something that would take him an 800 km trek to discover. We often go about our daily, weekly, monthly, and yearly routines as if we have chosen the lives we have. But have we? Did you choose to be born? Did you choose what family you were born into? Did you choose what schools you were first educated in? Did you choose every last detail of your life? The fact is, while we do have and make choices that affect our lives, we do not choose our lives. They are a gift given to us by God through our parents. Life is a gift that is meant to be used, and used abundantly. Along The Way, the father discovers that life is meant to be lived and he discovers that living life means living it in the company of others, even those who seem worlds apart from who you are. We do not get to choose our lives, but we do get to choose to live them and to be a presence of hope and faith, of love, support and encouragement for others along the way of our life’s journey. Christ calls us, as his disciples, to live life through sharing in the journey with others. Jesus was not just one person out in the country side, choosing his life all by himself; rather, he chose to journey with and encourage others who rather different than him. Sometimes their differences were downright frustrating; yet, Jesus chose to love them. From that loving bond came an even larger community of people who chose to join in with them, a community that continues on to this day through the Church. Today’s challenge is for you to stop pretending you choose your life and start living it. Live it in the presence of the people around you and live it in, through and with love! That is THE WAY to the Kingdom of Heaven. Make Jesus the way you live your life. Lord, I want to be more like you. Though I do not choose my life, I choose to live my life for you. Amen.